Anyone familiar with the Aurebesh will have no doubt encountered many signs in the game that seem to defy decryption. Sometimes glyphs are shaped unusually, often letters are inverted, ligatures appear where they shouldn’t, and the whole simply doesn’t make sense. This is clearly not Aurebesh according to Hoyle. And that’s because it isn’t. Nevertheless many of these signs can still be translated; you just need to try a different font. That font is Erik Schroeder’s Galactic Basic. In the course of his fascinating and extensive research into decoding the writing seen in Return of the Jedi, Schroeder discovered that the glyphs seen in the movie came from a design for alien writing (seen below) created by the great Joe Johnston at ILM in 1976. These symbols popped up in Star Wars and The Empire Strikes Back before being seen prominently as the language used in the scan of the shuttlecraft Tydirium. I assume that the original Aurebesh was designed using low resolution captures from the movies, but Galactic Basic was derived from Johnston’s original glyphs. While Aurebesh has become the official font, Galactic Basic more accurately recreates what appeared on screen. Even though the two fonts share some similarities, there are differences that render them mostly incompatible. Once you know what to look for, it’s easy to tell which font is being used, and it adds meaning to a whole bunch of signage in the game. From an in-universe standpoint, I would explain the differences as simply two related languages that use many of the same letters, such as English and French. A great many characters in Star Wars lore are polyglots, so it doesn’t strike me as odd that we encounter variations in similar languages across the galaxy. However, for simplicity’s sake I consider both to be Aurebesh since that is the canonical name for this writing and that both were inspired by the same source material. 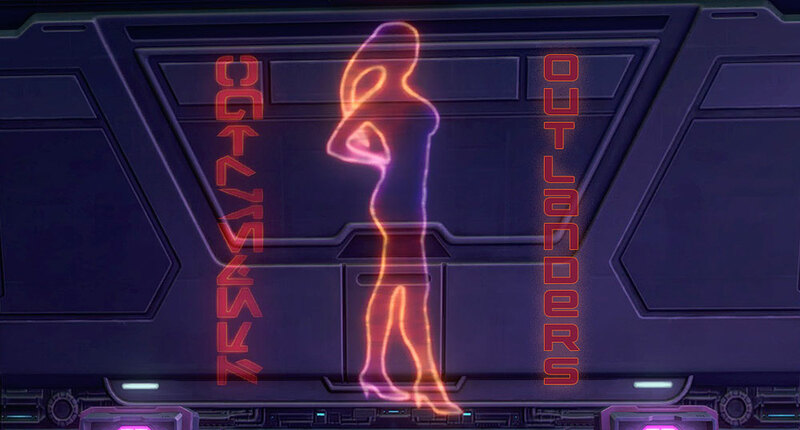 This sign can be found in several places across the galaxy, most prominently in the Bounty Brokers Association’s section of the Fleets’ Cartel Bazaars, Hutta, Ord Mantell and even Ziost. 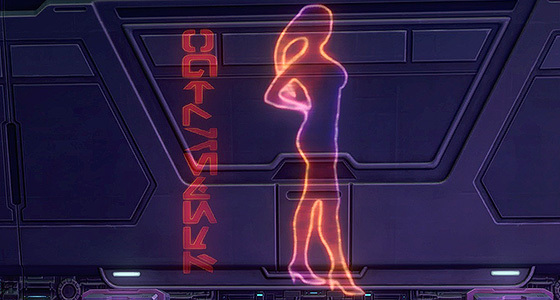 Unlike the versions seen elsewhere, the sign on Ord Mantell does not have horizontally flipped side panels, so it at least can be read right to left. BHG is almost certainly the Bounty Hunter’s Guild run by the Mandalorians. A Mandalorian crest, which first appeared on Boba Fett’s armor, appears on the right and center panels. The central display is dominated by a list of bounties with charming, Star Warsy names. The rewards for each bounty is written in both Aurebesh numbering formats: the standard numerals and “binary” dots and dashes. 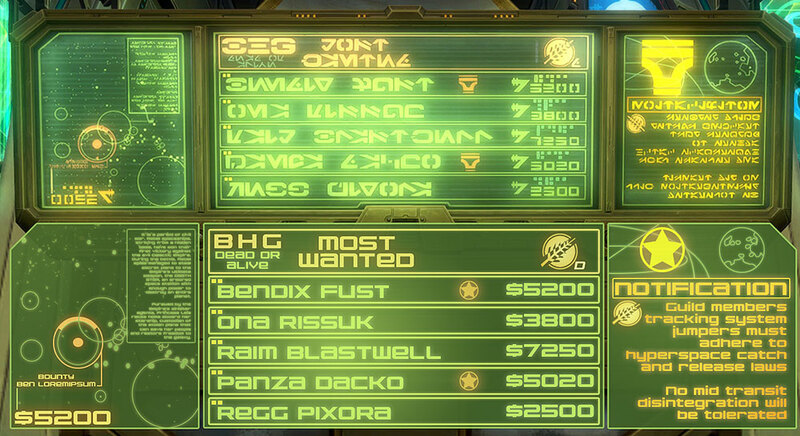 The right panel includes rules for hyperspace pursuit and the left pinpoints the location of another bounty, although most of the text, including the target’s last name, is too low resolution to clearly read. This post was written as I downloaded the latest patch, but I hope have some first impressions of Knights of the Eternal Throne next week.